The theme for tonight's Clandestine Cake Club is "Sporty or Naughty" as a celebration of the forthcoming Olympics. Having singularly failed to come up with a cake idea that is synonymous with Sport, I settled for Naughty, which basically means anything goes. With time not being on my side, and a need to make something that I've never made before, I decided to go for a polenta cake, to further use some up some of the bag of polenta that's still languishing on my storage shelves. The lovely Jacqueline from the Cake Boule blog recently wrote about a similar cake that was Mojito-inspired. I loved this idea, but lacked the 7" cake tin to make it in. I toyed with the idea of scaling it up to fit my eight inch tin but having read some theory on the Ruth from the Pink Whisk's website, I decided I didn't have the time or patience for that either (and her method required me to have a 7" tin to start with which kind of defeated the objective of the exercise for me). A quick search turned up a similar recipe in Kitchen by Nigella Lawson. The recipe is also available online which is really helpful. And it uses a 9" springform tin which I have so there was no faffy adapting. I then hit on the idea of using up some of the raspberry glut that my garden seems to be producing on a daily basis. I know this makes my CCC offerings rather typecast - my last effort was an epic Raspberry and Lime Swiss Meringue Cake - but I figured that it would be a pretty twist to an otherwise flat, yellow cake. Googling around for another recipe, I found this one from Jane Hornby on BBC Good Food. I was intrigued by the idea of using frozen raspberries rather than fresh so I popped some in the freezer, mixing three quarters in with the batter and adding the rest ten minutes before the end of baking. Given the often delicate nature of raspberries, it works really well. The healthy/sporty factor was further increased by the lack of flour in the cake. It's made with ground almonds and polenta so with the use of gluten free baking powder, it has some virtues. My biggest baking problem is always time. I never seem to have the time to savour the process. It's something that's always squeezed in during Miss A's nap or before work (so at about 5am) or late at night just before bed time. This often means I make mistakes or get a little stressed by missing ingredients. The entire kitchen was turned upside down looking for the baking powder. It's always to the right of the bunny biscuit jar. But while I was away at the weekend, the husband took it upon himself to "tidy up". I couldn't find it for love nor money so ended up making my own courtesy of this fabulous substitutes guide from Joy Of Baking. Everything was going smoothly. I was thinking about the look and texture of the batter so I could comment on it for this post. It had a lovely, sunny tinge yet was quite stiff and heavy. Obviously from the almonds and polenta. I popped it into the oven. Started to tidy. Found egg number three still sitting uncracked next to the bunny biscuit jar. That serves me right for trying to bake without my egg-cracking assistant. She would never have allowed such an oversight. As for other adaptations, I replaced the one of the lemons with two limes and added 25ml of tequila and a pinch of sea salt to the syrup for the Naughty bit. Just enough tequila to get a taste without putting you over the drink-drive limit. Essential when driving back from cake club. The salt to balance the sweetness of the sugar and give it that authentic margarita twist. It does make quite a lot of syrup, but if you spoon slowly, the cake will drink it in. If I was serving this for dessert, I'd probably use a side of lightly whipped marscapone, thinned with a little creme fraiche, sweetened with some icing sugar and spiked with lime and a pile of fresh raspberries from my garden. Will update with the verdict and some pics from cake club in the morning. Preheat the oven to 180°C/160°C (fan)/gas mark 4. Lightly butter the base and sides of the baking tin then base-line with baking parchment. Mix together the almonds, polenta and baking powder. Beat a third into the butter mixture followed by one egg. Repeat until all the dry mixture and eggs are incorporated. Beat in the zest, carefully fold in 3/4 of the raspberries (reserving the rest for decoration) then pour into the baking tin, smooth the top and bake for 30 minutes. Remove from the oven and decorate with the remaining raspberries by gently pushing them into the surface. Take care not to push too hard! Return to the oven for another ten minutes. Remove from the oven and check with a cake tester which should come out clean. The cake should be shrinking away from the sides at this point. Place the tin on a cooling rack. Make the syrup by boiling together the lemon and lime juice, tequila and salt with the icing sugar. Once the icing sugar has disolved, carefully prick the sponge all over (in between the raspberries) and carefully spoon the warm syrup over the cake. Leave in the tin to go cold before removing to serve. If you don't need this to be gluten free, but want it to be nut free instead, you could replace the almonds with 200g of plain flour. Updated: 2nd September 2012 - I've decided to enter this for the September 2012 Alphabakes competition. 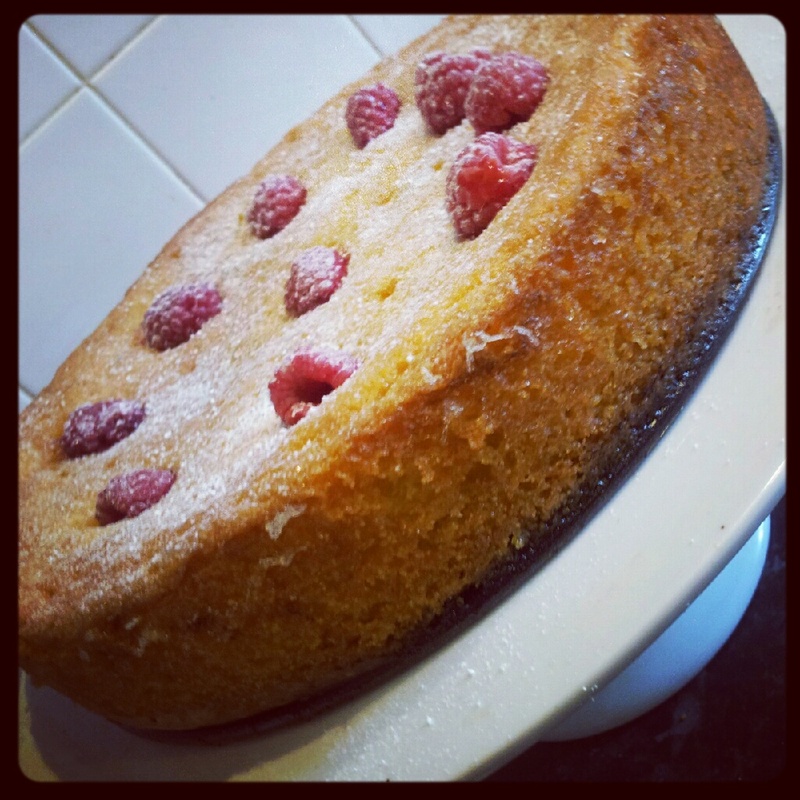 The key ingredient this month should begin with 'P' so polenta cake definitely counts! This looks gorgeous - cooking with polenta is a great idea (especially for people who need gluten free) and I like what you've done with it with the tequila! Thanks for sending it into Alphabakes! I found you through Alphabakes and I have to say I love this cake. I baked with polenta for the 1st time a couple weeks back - Sun-Dried Tomato-Pitaschio and Polenta cake on my blog and it turned out quite nice. 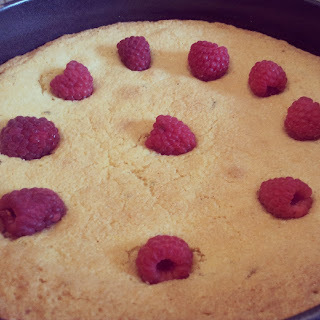 I love raspberries and polenta so I will have to give this recipe a try one day.